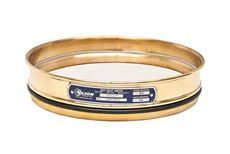 ISO 3310-1 Test Sieves - Gilson Co.
Gilson's 200mm and 300mm diameter ISO test sieves meet ISO 565 and 3310-1 specifications for Compliance Sieves, and are in stock for immediate delivery. Gilson offers all ISO 565 mesh sizes available. Every ISO sieve is fitted with a rubber O-ring for a dust-free seal when nested in a sieve stack. Many ISO opening sizes and tolerances are equivalent to ASTM E11 sizes. Verification of New Sieves upgrades ASTM and ISO Test Sieves to Inspection or Calibration grade. Our ISO Sieves are available with stainless steel frames and mesh, or brass frames with stainless steel mesh in full height or half height frames. 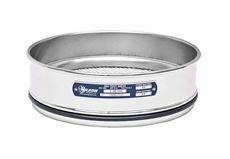 High-quality all-stainless steel sieves offer long service life and reduce specimen contamination. Half height frames allow more sieves to be used in a stack. For a reference guide print or download our Sieve Frame Comparison Chart. Sample volume and particle size determine proper frame diameter and height. Material is processed more efficiently and accurately on a sieve with more surface area, and blinding is reduced. The thickness of a specimen fraction on the mesh of a sieve should be no more than a couple of particles or layers deep. Frame height must permit proper agitation of the specimen, allowing larger particles enough room to reorient to the mesh surface. Stainless steel Backing Cloth with 500µm openings is available to reinforce 200mm or 300mm ISO Test Sieves with primary cloth 212µm and finer. Backing Cloth means the Test Sieve will last longer and avoids issues with sagging and distortion of the mesh. Gilson ISO Compliance sieves are supplied with a serial number and Compliance certificate. The certificates do not verify measurements of an individual sieve, but that the wire cloth and manufacturing methods comply with ISO requirements. 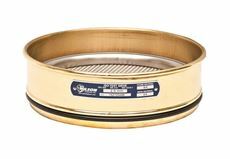 Inspection (99.0% confidence) or Calibration (99.73% confidence) Services individually measure sieves, and these services can be added to increase confidence that sieve meet ISO standards. To upgrade from Compliance to Inspection or Calibration Verification Services, please select from the Sieve Verification & Services drop down menu.